23 November 2009, at 8:15a.m. 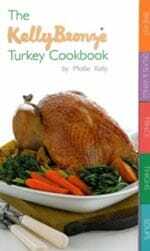 UK - Probably nobody has cooked turkey more often than Mollie Kelly, and now she is passing on her lifetime's experiences in a new cookbook. The publication, The KellyBronze Turkey Cookbook, has been launched to coincide with the 25th anniversary of the product which initiated the revival of bronze turkeys and is now the most highly prized Christmas bird. Mollie Kelly and her husband began rearing Christmas turkeys on their Danbury Farm in Essex way back in 1971 and it was her discerning palate that was the key to the family's quest to breed turkeys with exceptional flavour. She has cooked turkey at least once a week all her married life, and her four children grew up on turkey as her grandchildren are now doing. For many years, too, she demonstrated recipes at food exhibitions around the country. Over the years, her collection of recipes has grown like topsy and now she sets out 25 of her favourite dishes and passes on the sort of home-cooking tips never normally found in such books – such as making perfect gravy and stock from the bones. The handy size, wipe-clean book is divided into easy-to-find sections with recipes for different cuts including the sometimes overlooked leg meat and versatile turkey mince. Most of the recipes can be made using leftovers and there are twists on the old favourites such as Coronation turkey served in pitta pockets. Copies of the cookbook are being provided with KellyBronze turkeys ordered from Kelly Turkeys for Christmas (tel: 01245 223581 or click here).